I’m reading from the eastern U.S., and it’s chilly this morning! 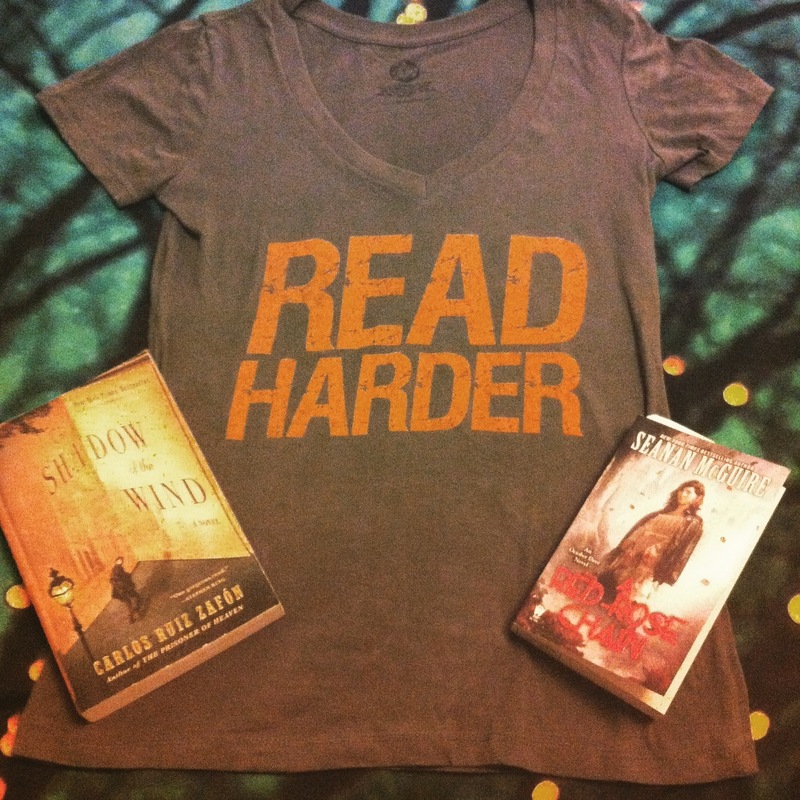 In addition to my Read Harder shirt (I got it from Book Riot! ), I have on very warm clothes and fuzzy purple socks. By far, I’m most looking forward to reading Carry On by Rainbow Rowell. I can’t resist anything that references Harry Potter, that critiques aspects of it while retaining a deep love of the source material (The Magicians by Lev Grossman is one of my all-time favorites, and the fact that Grossman wrote a very positive blurb on the cover of Carry On is promising). Um, all the snacks? But especially the spiced cider I got from Trader Joe’s. And also the chocolate I got from Trader Joe’s, because books and chocolate pair very well together. I have an unabashed love of pumpkin-flavored things. I know that the popularity of pumpkin and pumpkin spice has gotten really out of control, but it’s so delicious that I think everyone needs to just get over it. Also, although I do love beaches passionately, there’s something about cold-weather reading that is very special. This is my first time! I love the idea of dedicating an entire day to books, and I think it’ll be a great stress reliever for me. My plan is to update on my blog and on my instagram (I used to hate instagram until I realized all of its bookish uses, and now it’s so much fun) and spend the day switching between books. Although, I may get so absorbed in one book that I spend most of the day on it. That’s an unavoidable possibility. Hope everyone is having a great readathon so far! 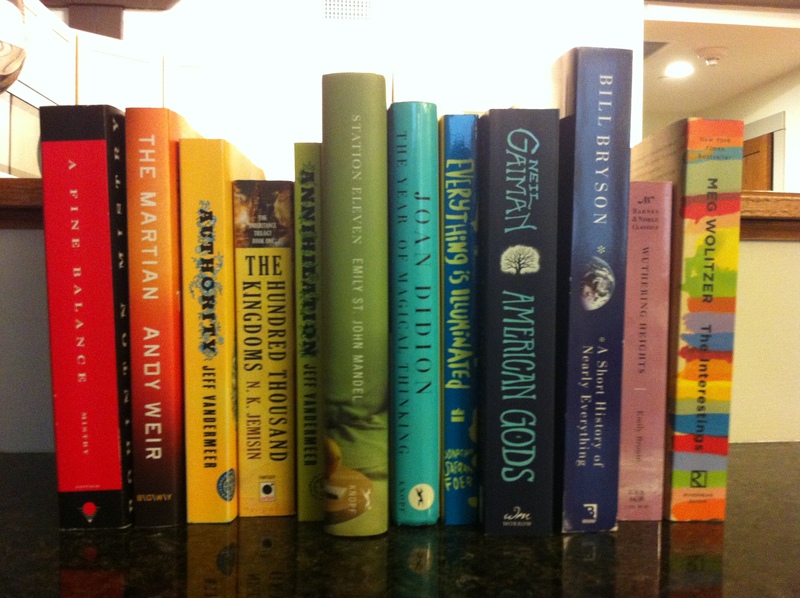 Tomorrow will be my first time participating in Dewey’s 24-hour Readathon, and I think I’m ready. The Wicked + the Divine: this graphic novel came out this year, and supposedly deals with gods that continuously reincarnate as pop stars. Since it’s short, I figure that this is the book I have the greatest chance of actually finishing tomorrow. Carry On by Rainbow Rowell: I’ve been anxiously awaiting this fantasy YA release since I finished Rowell’s Fangirl earlier this year. Fangirl was about a socially anxious college freshman named Cath whose refuge is fanfiction, specifically fanfiction chronicling the romantic lives of Simon Snow (a pseudo-Harry Potter) and his roommate/enemy, Baz (pseudo-Draco Malfoy, but a vampire). 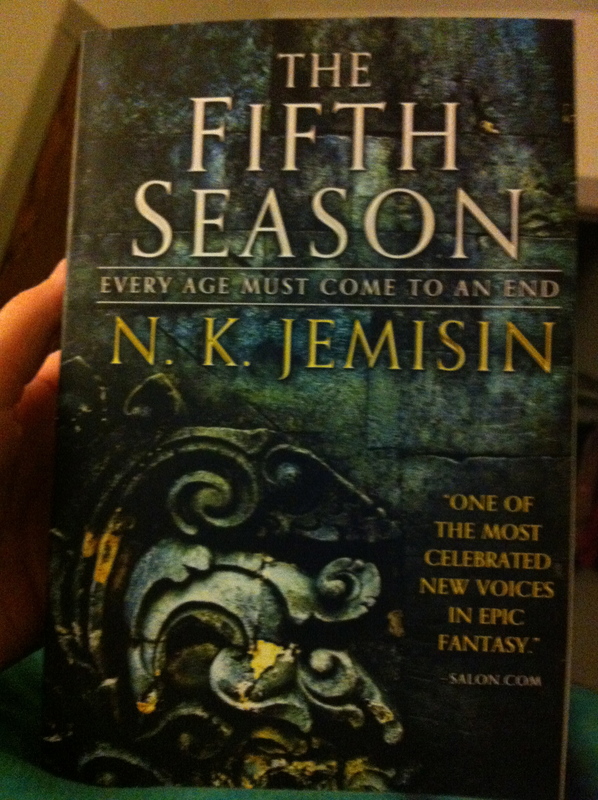 This is definitely the book I’m most excited about getting into during the readathon. The Girl With All the Gifts by M.R. Carey: this is an audiobook I started a few weeks ago for a science fiction/fantasy reading challenge. I’m about a third of the way through, and it’s okay, but not great. I figure that an audiobook will be a good way to keep reading if I need to take a break and do some cleaning or drive somewhere. The Shadow of the Wind by Carlos Ruiz Zafon: I’m about a third of the way through this magical book, and I read that third in a sort of trance at an airport. Trance reading seems like a good way to get through the readathon. A Long Way Gone by Ishmael Beah: I’ve had this book on my list for years; it’s written by a former child soldier about his experiences. It’s also fairly short, so I might be able to finish it during the challenge if I’m in the mood for some nonfiction. The Passion by Jeanette Winterson: I probably won’t read this during the challenge, but I like having the option. It sounds very good, but I’m not sure the readathon is the right time for it. A Red-Rose Chain by Seanan McGuire: this is book 9 in McGuire’s October Daye series. I started it last night and I find this series really comforting, although it’s not my favorite. Wish me luck! I’ll be posting updates tomorrow with my challenge progress. 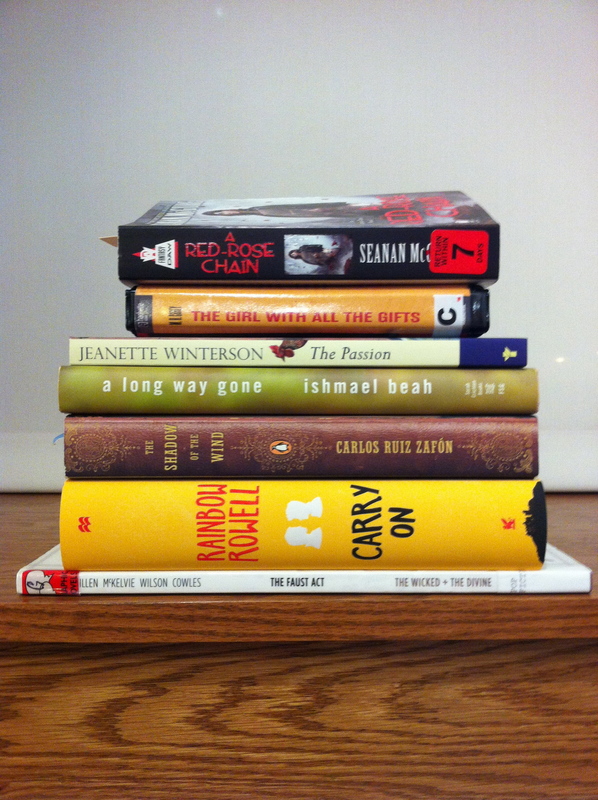 Are any of you doing the reading challenge? What are your planned reads? 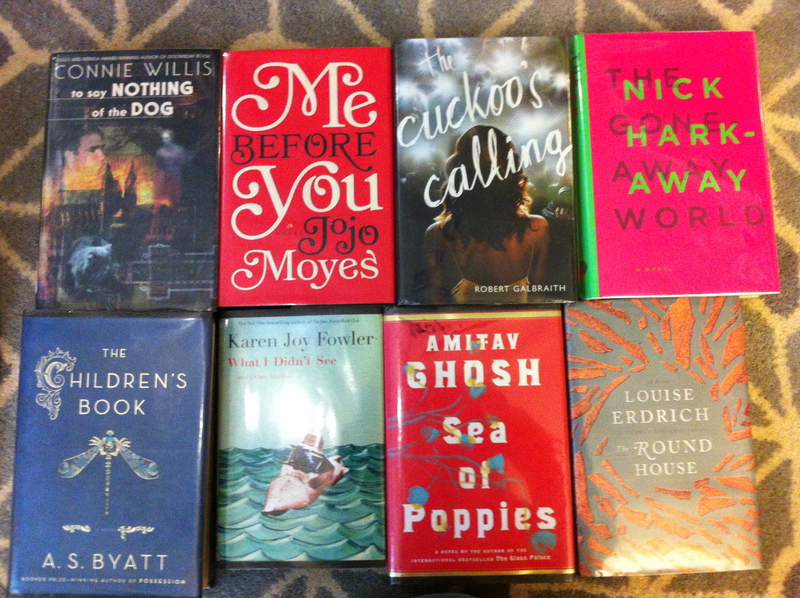 I found eight gorgeous hardcovers at a local library book sale recently. I love that I never find anything I expect at library book sales, but the books I do find are always an amazing surprise. To Say Nothing of the Dog by Connie Willis: I read Doomsday Book, Willis’s work about a time-traveling historian accidentally transported to the Middle Ages at the height of the Black Death, last fall. It was interesting, but extremely dark in tone–this book is supposedly lighter, while keeping the time traveling concept consistent. Me Before You by Jojo Moyes: I don’t really know much about this book, but I had seen it talked about on Goodreads and thought it might be a good end-of-summer read. From what I’ve heard, it’s a romance that induces copious amounts of tears. I feel like nothing could possibly make me ugly-cry more than The Fault in Our Stars, but I’m up for the challenge. The Cuckoo’s Calling by Robert Galbraith: I haven’t read any of J.K. Rowling’s post-Harry Potter books yet, but I think this will be a good start. I like a good mystery every once in awhile…just not too often, or I get tired of them. The Gone-Away World by Nick Harkaway: I don’t remember how I heard about this book, but I’ve been looking for it at bookstores and library book sales for a couple of years now and I never find it. Sure, I could just buy it online, but I like the thrill of the chase! It sounds delightfully weird and I can’t wait to start it. The Children’s Book by A.S. Byatt: I recently read Byatt’s Ragnarok, and it was one of the best books I’ve read all year (review coming soon!). This book, which was shortlisted for the Man Booker, centers around a children’s book author in Victorian/World War I-era England. What I Didn’t See by Karen Joy Fowler: Fowler’s We Are All Completely Beside Ourselves was one of the best-written and most emotional reads for me this year, and her collection of earlier short stories is supposed to be wonderfully weird. Sea of Poppies by Amitav Ghosh: I found this in a used bookstore a few years ago, but at the time thought it was too expensive to buy (it was maybe $8…haha). I held off and found it for $0.50 at this sale, so I guess the wait paid off! The Round House by Louise Erdrich: Erdrich is coming to speak in my city later this year, and I’d like to get more familiar with her writing before she comes. This won the National Book Award a few years ago. Although I love my library used book sales (as my massive book hauls and upcoming post illustrate), I also love checking out local independent bookstores. 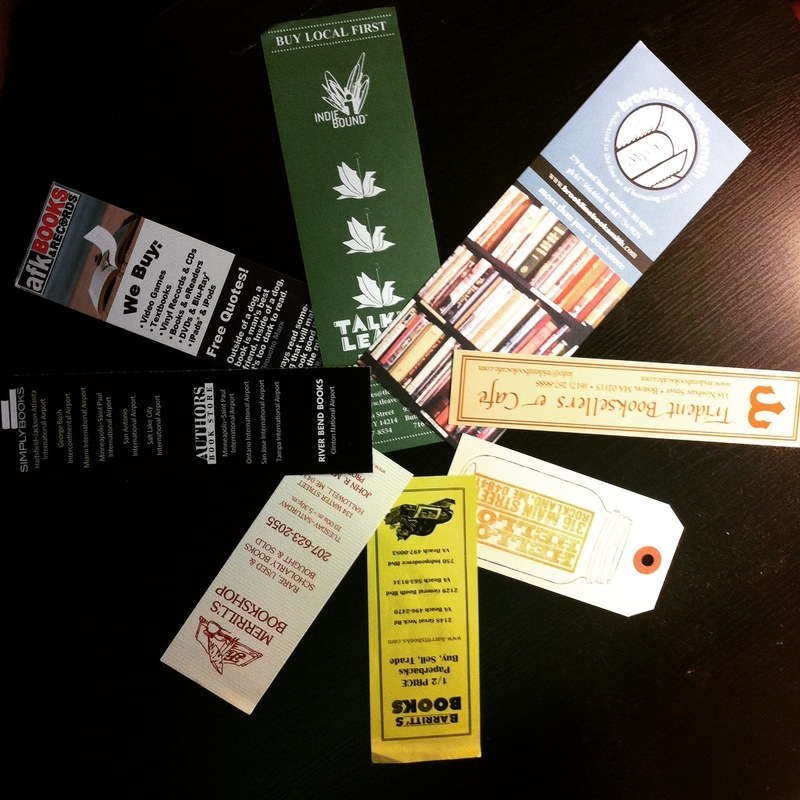 This year I was lucky enough to visit eight independent bookstores, and collected bookmarks along with the books I found there. I love finding new spaces to explore, and finding hidden gems within those spaces. 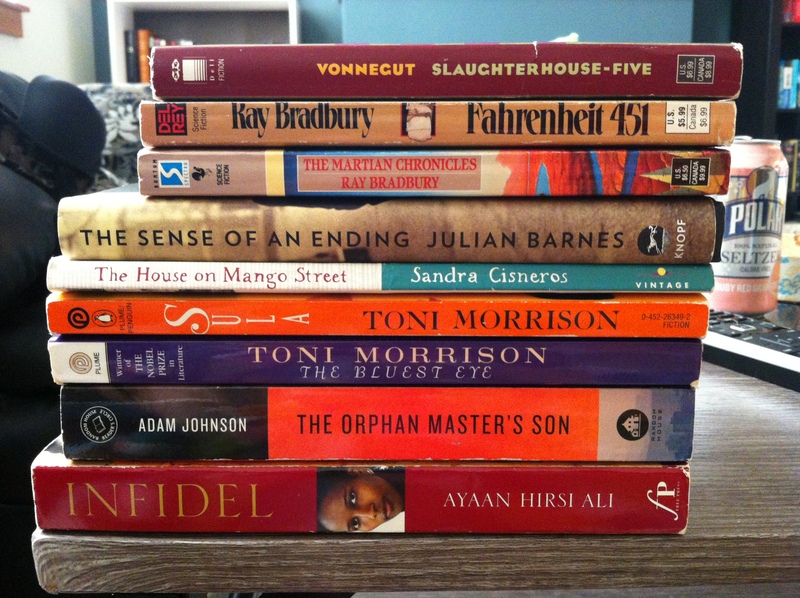 Library Book Sale Buying Binge Part 2! Slaughterhouse-Five by Kurt Vonnegut: science fiction classic that I remember reading in the library in high school. I’ve been wanting to do a reread since then–I remember the haunting feeling while reading it, but not the specifics. Fahrenheit 451 by Ray Bradbury: ditto on wanting to do a reread. I have stronger memories of the terrible, terrible movie version that I saw than of the book, which is just not okay. The Martian Chronicles by Ray Bradbury: one of my all-time favorites. It’s a series of short stories and all of them are haunting and beautiful and magical. I want to reread them and then rereread them, since it’s been awhile! The Sense of an Ending by Julian Barnes: this was on a list of highly recommended short novels I found. Sometimes you need a good short book to break up the more epic ones. The House on Mango Street by Sandra Cisneros: ditto! Sula and The Bluest Eye by Toni Morrison: Beloved is one of the most amazing books I’ve ever read. Incredible, heart-wrenching, profound, disturbing, makes you sob when you read it. I keep meaning to read more of her work and haven’t yet–so now I will. The Orphan Master’s Son by Adam Johnson: fiction, won the Pulitzer Prize, and about a North Korean soldier. I’m interested to see how this one is. Infidel by Ayaan Hirsi Ali: I like to mix up my fiction with some nonfiction, and this comes highly recommended.